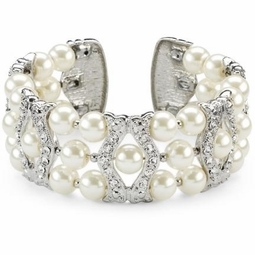 Description: Beautiful cuff bracelet features three rows of elegant white faux pearls and sparkling crystals laid into ornate silver detailing. 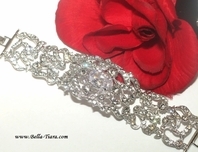 This lovely accessory is perfect for your wedding day, religious ceremony, prom and more! 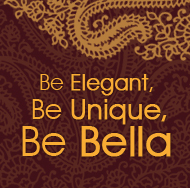 Size: Length: 7.5'', Width: 1'' .